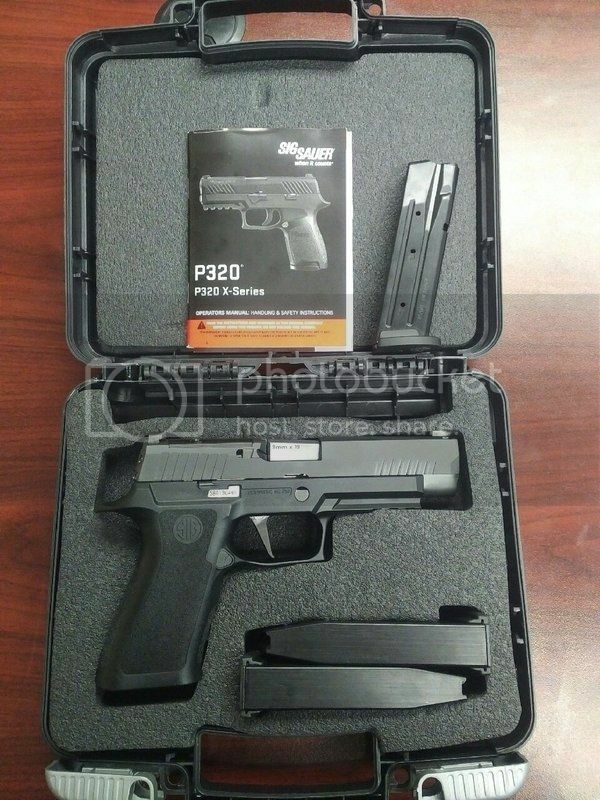 Picked this up a month or so ago, P320 X Pro Full size. Added a magwell funnel and 21 round magazines. Wasn't too long ago that I said I would never have a polymer framed striker fired gun, now I have two, this one and my P365, and I like them both. Very cool! Are you considering installing a ROMEO1 at some point? Yes, I think at some point that will happen, though I'm not sure if I'll go with the Romeo or something else. Gun looks awesome. Look forward to a range report when you have time. X Pro can only be bought by LE, correct? I really like the ROMEO1 personally. I haven't had any issues with mine, two of which are two years old, not even having to replace a battery although I have to admit that I don't carry. Both my P320RX and P226RX SAO came with taller sights as a back-up while the X-Carry I just picked up that came with a ROMEO1 does not. Guess that makes sense since you lose the rear sight when installing the ROMEO1 anyhow. I like that the rear sight is dovetailed onto the slide separately from the plate, but the sights appear to be standard height. I wonder if the stock sights would be usable after a reflex sight is installed? I do believe that it is only available to LE/Mil right now, I would expect that at some point Sig will offer it to all. A guy I work with bought the same gun and put the Romeo 1 on it. I have to admit that it looks very nice. I am toying with the idea of getting the RX slide, it comes with the optic and the higher sights that are co-witnessed. I can buy the slide with the optic and sights attached for about the same price as the optic and sights alone. That’s the replacement for the X5, correct? It looks good but I’d like to see them compared side by side. I was so close to picking up an X5 at some point and then lost interest with their discontinued status. The X-5 has not been discontinued. Not a replacement for the X5, an addition to the X series pistols. 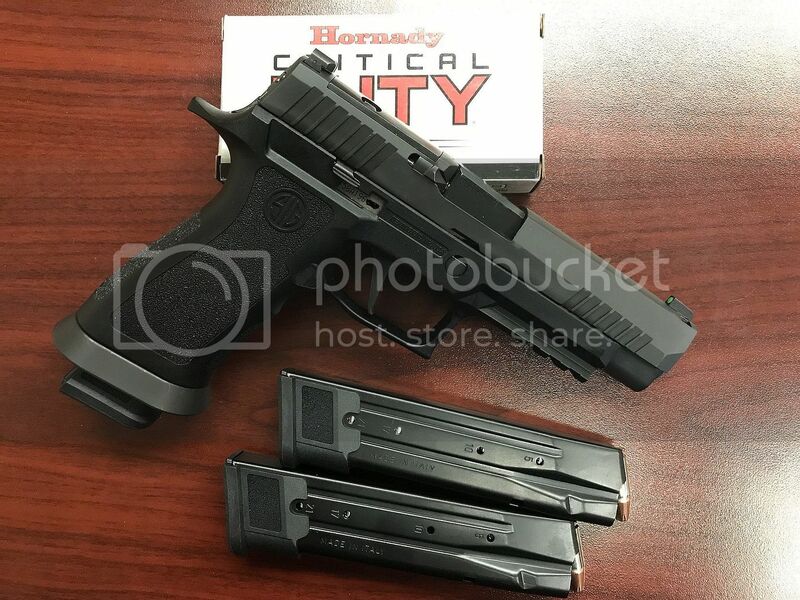 Unlike the X5, this one will fit in standard P320 duty holsters. I picked up a X Pro in Carry size today. Already had the Delta Point Pro and correct height Dawson sight waiting to be installed. Have to work this weekend but will get a chance to shoot next week. Would love to pick up a 320 X Pro. Anyone know when they will be available? Guessing as to demand, I'm sure they will sell at MSRP.